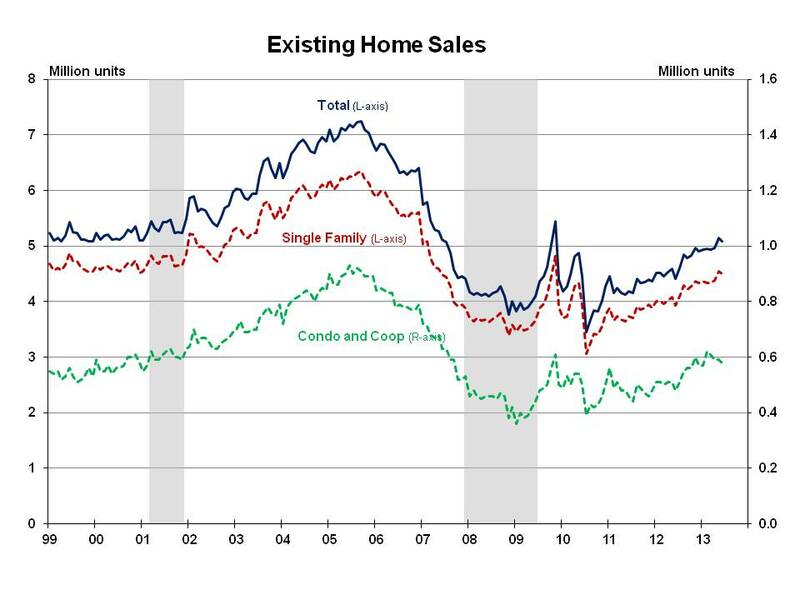 Existing home sales decreased 1.2% in June, but were up 15.2% from the same period a year ago. The National Association of Realtors (NAR)reported that June 2013 total existing home sales were at a seasonally adjusted rate of 5.08 million units combined for single-family homes, townhomes, condominiums and co-ops. That compares to a downwardly revised 5.14 million units in May, and 4.41 million units during the same period a year ago. The Midwest reported the same sales level as the previous month, and the other three regions decreased slightly. All regions were up from a year ago: 17.5% in the Midwest, 16.7% in the Northeast, 16.0% in the South and 11.0% in the West. The June 2013 level of single-family existing sales decreased 1.1% from May to a seasonally adjusted 4.50 million sales, which was up 14.5% from the same month a year ago. Seasonally adjusted condominium and co-op sales were virtually unchanged over the month, declining 1.7% to a seasonally adjusted 580,000 units, but were up 20.8% from the same period a year ago. The total housing inventory at the end of June increased 1.9% from the previous month to 2.19 million existing homes for sale. At the current sales rate, the June 2013 inventory represents a 5.2-month supply compared to a 5.0-month supply in May, and a 6.4-month supply of homes a year ago. NAR also reported that the June median time on market for all homes was 37 days, down from 41 days in May and 70 days during the same month a year ago. NAR reported that 47% of all homes sold in June were on the market less than a month. The share of distressed sales decreased in June to 15% of sales, down from 18% in May, and down from 26% in June 2012. Distressed sales are defined as foreclosures and short sales sold at deep discounts. The June level was the lowest since the beginning of the series in October 2008. The median sales price for existing homes of all types continued to climb in June 2013 to $214,200, up from $203,100 in May, and up 13.5% from the same period a year ago. NAR reported that June represented the sixteenth consecutive monthly year-over-year price increase. This month also represented the seventh consecutive month of double-digit year-over-year median price increases. The median condominium/co-op price increased from $199,100 in May to $210,200 in June, and was up 15.4% from a year ago. In June 2013, all cash sales were 31% of transactions compared to 33% in May, and 29% in June 2012. Investors accounted for 17% of June 2013 home sales, down from 18% in May and 19% during the same month a year ago. First-time buyers accounted for 29% of June 2013 sales, up from 28% in May, but down from 32% during the same period a year ago. NAR suggested that the decline in distressed sales contributed to the increase in the median sales price in June. All cash investors remained in the market, while first-time buyers continue to face tight access to credit and a limited supply of existing homes in their price range.